Our second day in Nasushiobara was spent around the Nasu Onsen hot spring resort situated under the looming Mount Nasudake. Apart from hiking trails, bathing in public hot springs, suspension bridges the resort includes the Heisei no Mori a retreat still utilised by the imperial family though the gardens are open to the public. One other noteworthy sight worth exploring is the Sesshoseki Murder Stone 殺生石. Just the name alone was enough to pique my curiosity – a murdering stone, I just had to see it for myself. 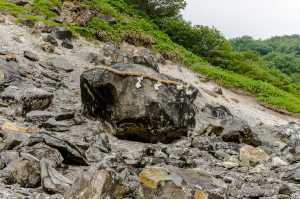 The term stone here is a little misplaced as it’s actually a large boulder embellished with a shimenawa (a length of rice straw rope used for ritual purification in Shinto religion). A boardwalk leads up to the Murder Stone and passes by a large assemblage of Ojizosans dressed in red knitted caps earnestly watching on. The vents surrounding the boulder have apparently been belching out noxious sulphur and arsenic fumes for centuries much to the displeasure of local wildlife. Legend has it that the stone is associated with Kuonokitsune a nine tailed fox that once tried to impersonate the lover of Emperor Konoe but its plan was thwarted with its soul turning into the Murder Stone. 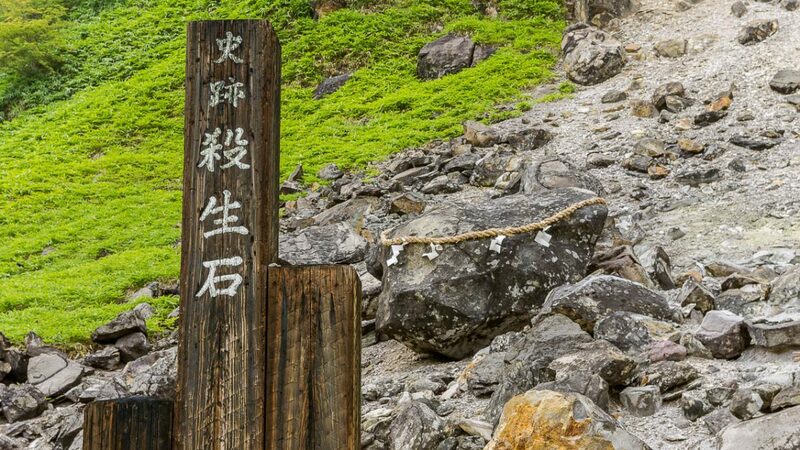 The Murder Stone is located on the road to the Nasu Ropeway and Mount Nasudake and has free entry.